Carefully remove the protective coating on the front and back for the perfect finish. Please note- mirror silver and gold material may be affected on the back by buttercream or moisture. Cover spike with covering or insert into straw and place eyes on at last opportunity. Material Acrylic. Handmade in Melbourne. Handmade tinplate steel cookie cutter set. 2cm high. Round 5cm, 2cm. Oval 4cm, 3cm, 2cm. Flower 4cm. Straight edge cutter 6cm. An exciting pack of boring shapes !! These simple shapes create a wonder of cupcake topper designs including animals, people and other fun shapes. Pack includes colour photos of animals and sketches of other designs, including which shape is used for each design. Handmade tinplate steel cookie cutter. Anzac slouch hat. Size 9×5.5cm. In memory of those…Lest we Forget. All our love. Handmade tinplate steel cookie cutter set. Anzac slouch hat. Size 9×5.5cm. Blossom, poppy flower and medium love heart included int his very special set. In memory of those…Lest we Forget. All our love. Here’s an idea! Bake and decorate and surprise your local RSL! Feeling blessed~! Sizes 3-4cm. Set of 9 assorted fun shapes. Great for use with fondant, gum paste for cupcake or cake toppers and modelling clays to make buttons, trinkets or make mini cookies and shortbread shapes. Cute little shapes. Handmade tinplate steel cookie cutter. Set of 5 includes Australia size 7.5x9cm, Flag size 7.5×7.5cm, Kangaroo size 11x10cm at widest part, Koala size 7x8cm, Wombat 7.5×5.5cm. 2cm high. Make the perfect fun, fruit or cookie platter for your family day this Australia Day. Handmade tinplate steel cookie cutter. Baby elephant. Size 5 x 6.5cm. 2cm high. Decorate with royal icing or use a gorgeous pattern in fondant using our patterned rolling pins! Other great animal shape cookie cutter shapes available. Mumma had a baby! This cute little elephant can be used in a variety of ways, from bite size cookies, 3D fondant shapes for cake toppers, fondant shapes on the side of cakes and even fruit or cheese bites.. Accompanied with his Mumma of course…Purchase separate or as a set. 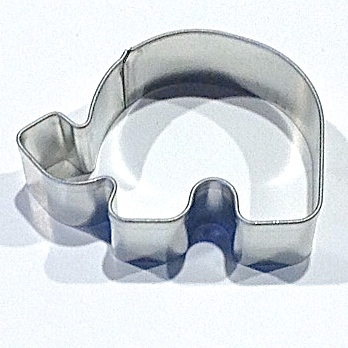 Stainless steel cookie cutter. Giraffe. Size 6.5x 4.5cm. At widest points. 2.5cm high. Mumma giraffe also available. Decorate with royal icing or use a gorgeous pattern in fondant using our patterned rolling pins! Other great animal shape cookie cutter shapes available. Stainless steel cookie cutter. Bat. Size 9×7.5cm. 2.5cm high. Decorate with royal icing or use a gorgeous pattern in fondant using our patterned rolling pins! Other great animal shape cookie cutter shapes available. Handmade tinplate steel cookie cutter set. Size 6.5 x 10.5cm. 2cm high. What a beautiful set to create gorgeous , fun and effective bird houses in a variety of designs. Comes complete with a 2cm round cutter for the bird’s door! Handmade tinplate steel cookie cutter. Bird medium. Size 7 x 5cm. 2cm high. Decorate with royal icing or use a gorgeous pattern in fondant using our patterned rolling pins! Other great bird shape cookie cutter shapes available. The most gorgeous, simple design cutter for bite size cookies or cupcake decorating, patterned fondant shapes, watermelon shapes, jewellery making, ceramics, modelling clay and embellishments. A very popular shape for crafters.